Billy MacInnis, a third generation fiddler, has been entertaining and wowing audiences since the ripe old age of five. 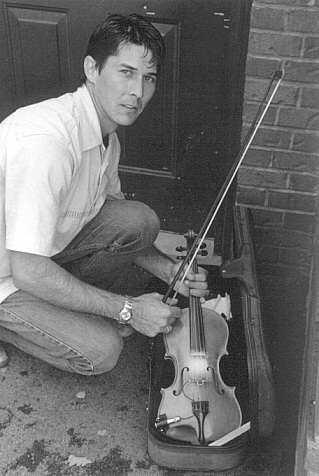 His first fans and still his strongest supporters are his parents, Lorraine (Ricard) MacInnis and BillMacInnis Sr, a seasoned fiddler and Billy�s mentor and teacher. Billy hails from Village Green, a tight knit Prince Edward Island communitywhich is now home to the annual Village Green Jamboree (in memory of greatsteel guitar player and cherished friend, Joe McGarry) and which providedBilly and his three siblings with a solid foundation and a picture perfectalbum of fond childhood memories. Billy started entertaining the public at age seven; delighting audienceswith the skill, devotion and talent of a true professional. Billy enjoyedplaying at the many dances and concerts and approached each with aneagerness and enthusiasm that would see him through many competitions andmany wins throughout the Maritimes and Ontario. Billy has composed many of his own originals and recorded his first recordat the age of 13 and went on to record four more albums; the lastestentitled �On the Bow Again�. Billy also composed and recorded a featuresingle, entitled �Wally�s Gold Cup Special, promoting Island harness racingand honouring famed horseman, 2001 Gold Cup & Saucer Race winner and PrinceEdward Island native, Wally Hennessey. Billy and his fiddle have been a welcome feature for many years onIslanders� radios during the daily Morning March. 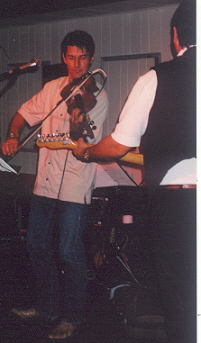 Billy played for a capacity crowd of 6000 at a reunion of Don Messer�s band,�The Islanders�. He also composed and recorded tunes honouring bandmembers, Duke Nielson, Waldo Munroe and Cecil MacEachern. Billy has had the pleasure of sharing the stage with many talented artistssuch as, Lennie Gallant and Rita MacNeil in recognition of the Royal visitto Prince Edward Island. And also with, Jason McCoy, Randy J. Martin andStompin� Tom Connors at the bicentennial concert celebration of Connors� oldstompin� grounds, Tignish, Prince Edward Island. Billy has also appeared with country music recording artists such as,Prairie Oyster, Joan Kennedy, John Allan Cameron and played guitar andfiddle with Silver Fire from Charlottetown. Billy is busy promoting his solo career and latest album, �On the Bow Again�across Canada. In his spare time, he enjoys playing in the band �NoBoundaries� and especially looks forward to the time spent with his family. Billy can be reached at 902-628-1911 or by email at bmacinnis31@hotmail.comfor information about bookings and cd orders. is currently in the Toronto Area on a mini-tour and at the same time promoting his new CD entitled, ON THE BOW AGAIN.Billy is being promoted by Atlantic Seabreeze, and is having Billy guest appearing on many Country Music Shows to introduce his music to Ontario. Billy is being swarmed by music fans, and the response has being unbelievable. He was featured guest on Friday night on the Johnny Butts and Quarry Road Country Music show in Mississauga and on Saturday night performed as part of the band, Josie & The Boys in Mississauga as well. Many more appearances are being planned for the next two weeks. Billy is currently being featured as Profiled Artist of the Week on Atlantic Seabreeze Website. Nightclubs who wish to have Billy featured in their Club within the next two weeks before Billy returns to P.E.I., please contact John at 416-1255-3127 or e-mail at g3127@rogers.com. Oliver and Leyte Show (twice) at Eastern Passage, Brampton. Waterdown Country Jamboree-Waterdown Legion, Waterdown, Ont. Josie & The Boys Show at Rampt & Rose, Mississauga, Ont. Billy also did some fiddle tracks at Sal Noguers's Studio (drummer for Oliver & Leyte) for Music Artist Michael T. Wall while in the area. 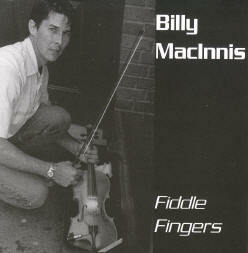 Billy has just released his fifth album entitled, FIDDLE FINGERS in February 2006. To read a review on this fine CD, click into new releases on this website.